Sure to bring “Mounds” of “Joy” to all who encounter them! This easy recipe is inspired by my love for the classic blue wrapper candy featuring that oh-so-familiar flavor combination of chewy coconut, rich dark chocolate, and nutty toasted almond. Indulge your inner sweet tooth with my recipe for Coconut Bon Bons in just a few minutes with only four ingredients! In a medium mixing bowl, combine coconut and condensed milk. Mix to thoroughly combine. Portion into balls using a table spoon of filling and roll between your palms until round and uniform. Place on a cookie sheet to chill for a minimum of 30 minutes. Add chocolate to the double boiler. Using a rubber spatula, mix the chocolate to melt. Once the chocolate has melted, remove from the double boiler. PRO TIP: Take care to not get any water into your chocolate as this may cause it to seize up and become impossible to work with. Saving chocolate that has seized up on you is not impossible, but it’s time consuming and difficult. It can be accomplished by slowly adding hot water to the chocolate and stirring until it’s smooth again. Alternatively, if you prefer not to use a double boiler, you can use a microwave to melt your chocolate. Do so by heating your chocolate in 30 second increments and stirring to ensure it doesn’t get burned! Place your chilled coconut filling portions into the chocolate. Use a spoon to gently coat the portion in chocolate. Place on a sheet tray lined with parchment paper. While the chocolate is wet, garnish with a sprinkling of toasted, minced almonds to your preferred aesthetic. Place back in the fridge to set. Transfer to an air tight container and store in a cool, dry place or in the refrigerator. Bon bons will keep for up to a week, refrigerated. One recipe yields approximately 18 pieces. 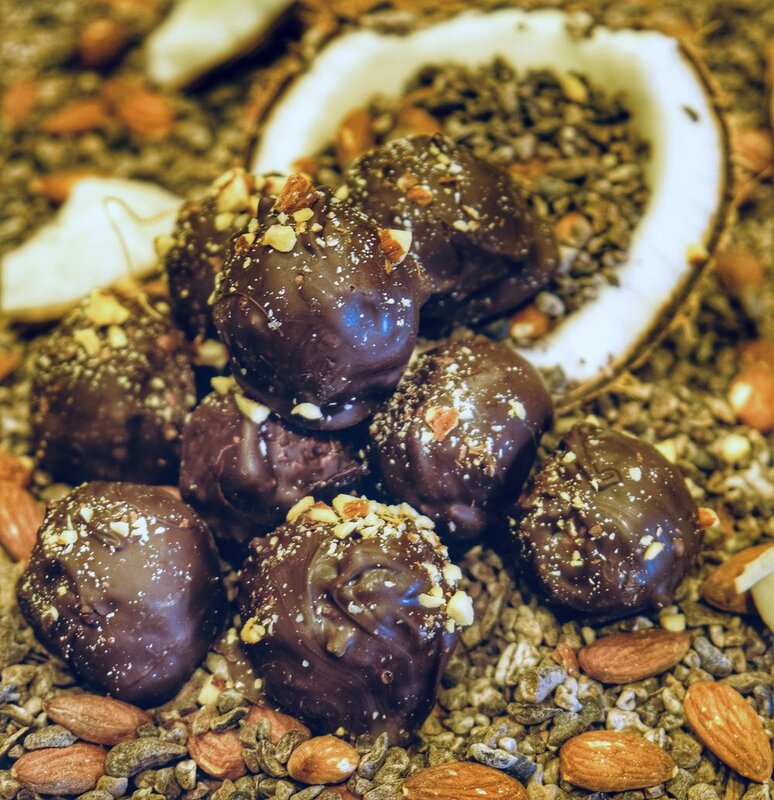 Try this easy recipe on your own, or pick up a few of these bon bons in the Tasting Room on Saturday when However Improbable, our Double Barrel/Triple Coconut stout collaboration with Moksa Brewing is released! Posted on January 11, 2019 by Patrick Whittaker. I’ve got an unofficial list of “must haves” every holiday season, and surprise, surprise, they’re all food. Always number one: green bean casserole. Like the kind your hillbilly aunt visiting from Missouri would plop down on the potluck table with a heavy thud, showering the runner in a smattering of crispy deep-fried French’s onion topping. Rounding third — my Grandmother’s gravy. The story here goes that back in the 60’s, my grandmother was preparing her very first Thanksgiving feast and had phoned her mother back in Texas for a few recipe pointers. Well, something was seriously lost in translation and she ended up adding thinly sliced boiled eggs to her brown giblet gravy. Much to her surprise, the gravy was a hit, and every year I recreate her perfectly-imperfect recipe. Lastly, and a jewel among the rest, is my Mother’s English-style toffee. Layered with semi-sweet chocolate and finished with a generous sprinkling of minced, toasted almonds, this buttery confection is a jewel among my holiday traditions. Drawing inspiration from my family’s collective traditions and Bottle Logic’s traditional November release of Darkstar November, our Bourbon Barrel Aged Imperial Rye + Molasses Stout, I developed my recipe for molasses toffee with dark chocolate, toasted pecans, and Maldon’s sea salt. If you’re on team sweet and salty, like me, this confection ticks all the glorious, gluttonous boxes of holiday decadence -- the crisp, buttery crunch, the melanoidin nuttiness of toasted pecans, the brooding depth of nearly-bitter dark chocolate, and the savory saline depth of Maldon’s sea salt. Stage a cookie sheet with a silicone baking liner or Silpat and reserve for later use. Pro Tip: Don’t own a Silpat? You can substitute one for aluminum foil greased with butter! Want thicker toffee? Use a deeper baking dish instead of a cookie sheet! In a medium sauce pan over medium-high heat, melt the butter, stirring occasionally. Once the butter has melted, add the bourbon and sugar, stirring occasionally. Pro Tip: Working with sugar is dangerous and requires your undivided attention! Boiling sugar will burn you with the intensity of a thousand suns. Put a shirt on and be careful, Karen! Once the mixture has started to boil, cover with a lid and boil for one minute. But why, though? During the cooking process, tiny sugar crystals will begin to form on the exterior of your sauce pan. Left to their own devices, these crystals will make for grainy toffee. That’s no bueno, compadre. Covering the pan at this stage will generate a small amount of steam that will gently remove these crystals from the sides of your saucepan, yielding a better finished product. Remove the lid and reduce the heat to medium. Cook the mixture until it turns a deep deep golden color and reads 290 degrees on a digital thermometer. I said put a shirt on, Karen!! Carefully pour the mixture onto your reserved cookie sheet. Don’t scrape the pan as there may be some residual sugar and may make your toffee grainy. Allow the mixture to cool for one minute. Sprinkle the chocolate pieces over the warm toffee and let stand for 30 seconds or until they begin melting. Use an offset spatula to gently spread the chocolate over the toffee, making sure the surface of the toffee is completely covered. Sprinkle toasted pecans over the chocolate. Lightly season with Maldon’s sea salt. Place the cookie sheet in the refrigerator to set for at least one hour. Once the toffee has cooled, cut or break into pieces and store in an airtight container in a cool, dark place or refrigerator. Toffee will keep for up to a week. Posted on November 17, 2018 by Patrick Whittaker. Proper beef/fat ratio: That’s right kiddos, this isn’t a diet show. If you want a good flat top burger, you’ve got to have fat. It’s that rich, umami sumptuousness that makes the world go-round. 80/20 beef to fat ratio is my preferred blend. 80/20 chuck is a readily available option, or if you own a meat grinder, experiment with specific cuts of beef and use the same beef/fat ratio. Every cut brings its own unique flavor and texture to the party, don’t be afraid to experiment to create your own proprietary burger blend! Respect the Burger: Don’t overwork the beef with your hands -- handle it just enough to form a loose ball and season it simply and liberally with kosher salt. And for the love of all that is beefy- it’s not meatloaf, friends. Don’t add onions or liquid to your hamburger. Treat your burger like a steak and cook it over medium-high heat and focus on getting a good sear. I use a lateral cooking method that is comprised of a hard sear on your presentation side, and a shorter cook on the second side to ensure even doneness. -- More on that later. The Bun: It’s not an artisanal brioche or ciabatta. It’s an old school, liberally buttered, griddle-cooked hamburger bun. The kind of bun that leaves little finger shaped imprints from where you may have squeezed it just a little too hard in that first bite. Don't go huge -- you don’t want the bread detracting from your burger. Choose something soft and pillowy, but sturdy enough to maintain burger integrity until the final bites. The Cheese:. American cheese without question. You can’t make a proper flat top burger with anything else. When American cheese melts on a burger something magical happens -- a thin veil of warm, gooey sexiness caresses the patty like a comforting duvet of plastic, velvety nostalgia. This is comfort food -- don’t try and chef it up too much. The Garnish: You may be sensing that I’m an evangelical burger purist, here. Save the veggies for your side salad, they’re better there. I like garnishes to enhance a burgers natural qualities and create a greater depth of flavor -- they shouldn't detract or muddle the flavor of the burger. Grilled onions for Malliard sweetness and a fist full of crispy dill pickles for a burst of acidity to cut through the fat. The Spread: Adding sauce to a burger is important. It adds flavor and, perhaps more importantly, protects your base (in this case the bun). If you’ve grilled your bun correctly, you should have a golden brown toasty base for your burger to rest. By adding a liberal layer of spread, you’re protecting the toasty textural contrast that you’ve worked so hard for and preventing your warm patty from steaming and compromising the integrity of the bun. The devil is in the details they say. Timing is everything: Prepare your mise en place before you start cooking. Staging all of your ingredients, toppings, and sauces then keeping things clean and tidy makes the difference between enjoying a good burger and a great burger. You should be chomping away at your gastronomic contribution to man kind within a few minutes after it’s finished cooking. Cold burgers aren’t good burgers. In a sauté pan over medium heat, melt 4 Tb of unsalted butter. Add shaved onions to the pan and gently cook until caramelized and soft, about four minutes. Using a scale, weigh out four loose, 4 oz balls of hamburger. Stage on a plate. Add your hamburger portions to a preheated cast iron skillet or griddle at medium-high heat. Apply firm pressure with a spatula to spread the meat out into ¼” thick patties and press for approximately 30 seconds. Season the exposed side with kosher salt and cook for about three minutes. Gently flip the patty. Season with kosher salt. Cook for approximately 30 seconds. Add American cheese. Cover with a lid and cook for approximately one minute or until your cheese has melted. Apply a liberal amount of softened, unsalted butter to a hamburger bun. Over medium heat, gently toast the bun until golden on both sides. Coat toasted bunswith an even amount of mayonnaise or spread. Add a heaping tablespoon of grilled onions to the base of the bun. Top the onions with your burger. Top the burger with 4-5 dill pickle chips. Cover with the top of the bun and enjoy! Shake, Rattle, & Roll is nostalgia in a bottle. This Neapolitan shake-inspired Bourbon Barrel Aged American Strong Ale was brewed with both lactose and malted milk sugar to give the beer a rich, creamy mouthfeel reminiscent of that secret menu delight! Indulge with a scoop of ice cream after a classic American smash burger! Posted on June 30, 2018 by Patrick Whittaker. If you’ve wandered into our Tasting Room and have met me behind the bar, you know I’ve got an old soul. I’m a fan of all the anachronisms of yesteryear, and in particular, have a very soft spot for Polynesian culture and Tiki-inspired cocktails. The nostalgic island mystique coupled with the well-honed skills of an intrepid bartender guarantee an evening of adventure, no matter where you're sipping. On a recent trip to Chicago, I had the pleasure of enjoying a few of Paul McGee's (Beverage Director/Partner at the Lost Lake) expertly crafted tiki-themed libations and quickly became enamored with his commitment to faithfully showcasing the versatility and culture behind these vintage-style cocktails. Inspired to create a unique cocktail of my own, I looked toward a local legend in riffing on the classic "Beachbum" Berry recipe “Mr. Bali Hai” from San Diego's Bali Hai institution. I present to you: Breakfast in Antigua, featuring Ground State, our Bourbon Barrel Aged Breakfast Stout! Prepare your juices for the cocktail. Clean, cut, and juice your pineapple and limes. Take care to reserve your pineapple fronds for an optional garnish! Add the light and dark rum to a cocktail shaker along with maple syrup, lime, and pineapple juices. Add 12 oz of crushed ice along with a few large cubes to your shaker. Vigorously shake to combine for approximately 30 seconds. Add 2 oz of Ground State to your preferred serving vessel and top with the contents of your shaker. Garnish with pineapple fronds and a straw. Enjoy! This cocktail combines the unlikely pairing of coffee, maple, and pineapple to create a mélange of dark, nuanced flavors -- a sultry combination of sweet and spicy. Earthy Guatemala Antigua coffee beans contrast with the subtle sweetness of Vermont maple syrup, accented with just a touch of Madagascar vanilla and once-thought-lost Fortunato cacao nibs. The result: a spirited grog with notes of brûléed pineapple, molasses, and earthy coffee, paying sincere homage to its inspiration with a nod toward the future. It’s best leisurely enjoyed with good friends new and old, illuminated by tiki torch on a warm summer evening. Posted on June 4, 2018 by Patrick Whittaker and filed under Food Bloggin' and tagged beercocktail. These guys are normally so busy that our guests don’t often get the chance to talk to them, but don’t worry, we're pulling back the veil of mystery to meet two of our mighty brew staff today! CHRIS- Overwatch. It reminds me of Team Fortress. I like all the storylines. All the special events and plots are cool. I’ve put too much money into those loot boxes. I have two stars, so I am on the 3rd star now. KYLE- World of Warcraft. In approximately 11.5 years, I've clocked about 420+ days. I've dedicated almost a year of my life to that game. Did you know Brandon Buckner is in WOW? He's Brandon Buckbeard. He's in a beer bar in Dalaran and talks about how much he wants coffee in his beer. You have a front-row seat to everything in the brewhouse -- what is your favorite BLB beer? KYLE- I love Hanamachi -- we're working on a fresh batch currently! CHRIS- Probably Haze Shift. It reminds me of The Alchemist's Heady Topper, which doesn't really seem to be on people's radars anymore. We are all nerds here, so what is your favorite television show? CHRIS- The Venture Brothers, it's an Adult Swim old-school one. That’s probably my favorite. My wife and I bonded over that show- we would watch it all the time in college. It has a lot of TV, movie, and comic references. You have to watch episodes again and again to get all the references. What is your biggest contribution to BLB? KYLE- That’s a tough question... like one of Steve’s interview questions... It'd have to be wrangling the Maheen. CHRIS- That's definitely one of the best ones for Kyle -- he's the main reason our bottling runs have improved so dramatically. For me, I would say... knowledge from my previous work experiences. Siebel helped a lot. I did the 6 week program. The aliens have descended and you can only keep one beer with you to survive on before they discover your hiding spot and steal your brain. What is it? KYLE- Sierra Nevada Pale Ale pale ale. Simple. Awesome quality. It’s basically what got me into brewing. CHRIS- So many options. I want something drinkable, but if it can be anything…. I’ll do Russian River’s Blind Pig IPA. CHRIS- Might & Magic, mostly Bottle Logic stuff, I think. I have a Christmas Bomb in there from Prairie. I will have some Other Half in there soon (insert maniacal Austin Powers finger jitters). KYLE- Right now my fridge is split. I have either heavy doubles and triples or PBR. I opened a few PBRs last night. You know those times where you just wanna drink something light? How has beer industry influenced your life? CHRIS- I decided I wanted a career in beer when I had an internship in DC (I was a PolySci major). I went to the biggest beer bar out there- Church Key. They poured Cantillon’s Rosé de Gambrinus, their raspberry sour. Just to experiencing the beer culture there made it so memorable. I was more excited about the beer than my internship. Posted on May 23, 2018 by Marissa Maynor. Do a little searching on the inter-webs to find a high-quality cheese monger in your area. Skip the normal chit-chat and dive right into the friend-zone by incorporating “cheesy” puns throughout your encounters with them. Sure, they might act like they’re unamused or even feign irritation, but the truth is, all cheese mongers are suckers for word play. Prime examples include; “I’m so glad I fond-ue," or “You and I would look goud-a together." Chances are, you’ve caught them off guard and they’re probably uncomfortable (but secretly flattered) -- that’s good! Now they'll be inclined to answer all your queso-related questions quickly and accurately, as they’re doubly motivated to break free of your pun-snare and end this social interaction as quickly as possible. It's all about the approach, you know? For our savory service today, I’m using Point Reyes Bay Blue Cheese -- it’s my absolute favorite blue to work with. Reminiscent of Stilton, the unique creamy texture allows bold notes of salt and caramel to truly shine in this application. Point Reyes Original Blue would be fabulous here as well. Not a fan of blue cheese? An equally exquisite option would be Humboldt Fog by Cypress Grove Creamery -- it's an out-of-this-world goat cheese with tons of complexity and classic earthy flavor. Even a milder Chevre would work well too. The grand world of cheesy choices is a delicious rabbit hole -- seriously, find a local cheese shop, get to know some of the folks behind the counter, and get ready for endless adventure. Visit frequently and ask them what's new, what's weird, and what they love. Find a new favorite and roll into my next recipe; it's perfect to pair with our next Stasis Project: the macadamia nut cookie-inspired bourbon barrel aged strong ale, Staff of Asir. In a food processor, pulse the herb crackers until they become fine crumbs. While the processor is running, gently stream in the slightly cooled brown butter until the mixture reaches the consistency of wet sand. Take a 9” spring form baking pan and line it with parchment paper. Grease the pan with unsalted butter or non-stick cooking spray. Transfer the crumble to the bottom of the pan. Using the flat bottom of a cup, firmly press the crumb mixture into the pan until you’ve formed an even base. In a 350˚ oven, blind bake (=baking a pie crust or other pastry without the filling) the crust until fragrant and lightly browned, approximately 15 minutes. Allow the crust to cool before use in the next step. Reduce the heat of your oven to 325˚ degrees. Pro Tip: Allow your cheeses to come to room temperature before mixing for a smoother filling. In a stand mixer using a whisk attachment, mix the cream cheese and blue cheese until airy and smooth. Add the lemon zest, minced thyme, sour cream, kosher salt, and cracked black pepper to the mixture. Mix to combine. Add eggs one at a time while the mixer is running. Allow the mixer to fully incorporate the first egg before adding the second. Stop the stand mixer and scrape the sides of the bowl into the center. Mix again for an additional 30 seconds. Add the cheesecake mixture to your cooled crust and bake in the oven for approximately 1 hour. The finished cheesecake should be golden brown with the tiniest jiggle when gently shifted. Allow the cheesecake to cool completely. Once cool, refrigerate for a minimum of 4 hours prior to serving. In a saucepan, combine all ingredients except the pears. Stir the mixture over medium-high heat until the sugar dissolves. Gently add pears to the mixture and bring the sauce pan to boil. Reduce the heat to medium-low and allow the pears to gently poach in the bourbon mixture until tender, approximately 5 mins. Remove the pears and allow to cool for later use. Return the heat to medium-high and reduce the bourbon poaching liquid to a syrup. Allow to cool. In a small mixing bowl, gently dress the pears with the bourbon syrup and a light drizzle of extra virgin olive oil. Lightly season with salt, fresh cracked pepper, lemon zest, and minced thyme. Incorporate toasted macadamia nuts as a finishing touch to this garnish. Transfer the cooled cheesecake to your preferred serving platter. Arrange the pears on top of the cheesecake to create an alluring centerpiece for any occasion. I’ve opted to add a peppery salad of arugula lightly dressed with extra virgin olive oil and lemon juice and some toasted macadamia nuts. Enjoy a slice as a savory end-of-meal treat in lieu of dessert, or add a hearty wedge on a thoughtfully selected cheese plate to share with friends. Pair with a generous pour of Staff of Asir, where the cocoa butter richness of this unique brew is beautifully contrasted by delicate fruity esters and macadamia nuttiness -- a natural complement to the salty, savory flavors of Point Reyes Blue Cheese. Staff of Asir is a masterfully blended collaboration between Horus Aged Ales and Bottle Logic and is the liquid embodiment of the culinary classic White Chocolate Macadamia Nut Cookie. This American Strong Ale was brewed with macadamia nut flour, lactose, and cocoa butter before fermentation, aged in bourbon barrels, then filtered through more than one hundred pounds of macadamia nuts for their creamy, sweetly rich character. Brown sugar base notes from caramelized malt melt into the soft flavors of oak and Madagascar vanilla beans for a perfect sip of fresh-baked nostalgia. Tickets go live at noon this Sunday -- check out the sale site for all the details! Posted on May 18, 2018 by Patrick Whittaker. The soul of this dish is inspired by years of late nights spent decompressing with my fellow line cooks and brothers in arms, sharing boisterous stories from the day's kitchen service over a few brews and simple, delicious food. We'd show off stinging grease burns and brands from white-hot oven doors, beaming with pride. These were our trophies -- hard-earned commendations awarded at the end of a battle. Life seemed simpler then, though each day on the line presented its own unique set of challenges and new techniques to perfect. As a young cook closing out a grueling 12-hour, 350-person dinner service, there were typically two things on my mind: cold beer (lots of it), and good grub. A warm bowl of phở and a few skunky macro lagers usually fit the bill just fine. 24-hour phở joints were always well-stocked with both of these staples, and proved to be ideal spots for our motley kitchen crew to relax after a long shift. There’s just something uniquely therapeutic about a simply built, no-frills bowl of clear broth, toothsome vermicelli, fresh herbs, and savory beef. This recipe is a throwback to the textures and flavor sensations I enjoy in phở, fusing them together with a flavorful Thai-inspired curry broth. The broth is luxurious and warming as it features the bold, aromatic flavors of ginger, garlic, caramelized onion, and lemon grass. Fresh herbs and vegetables provide a bright freshness that serves to further elevate the gastronomic experience. The unique temperature contrast of the chilled soup and warm, braised beef lends complexity and intrigue to the dish. It's the perfect entrée to pair with the fleeting days of Spring and prepare for the return of our warm Southern California Summer nights. Let this recipe for my Miso Soup with Braised Beef warm your soul! In a large pot over medium-high heat, add canola and sesame oils. Once the oil starts to ripple, add onion. Cook until translucent. Add garlic, cook until tan and fragrant. Add the Thai chili, curry paste, turmeric, fish sauce, and sugar. Cook for approximately 30 seconds. De-glaze with vegetable stock. Bring the broth to a boil, then reduce to a simmer. Add ginger and lemon grass. Stir in miso paste to combine. Simmer for approximately 30 minutes. Using a fine mesh sieve or colander, strain the broth into a mixing bowl. Place that bowl over a second bowl filled with ice. Whisk until cool. Once broth has cooled completely, add the coconut milk. Season to taste with kosher salt and soy sauce. Reserve for plating. Set up two pots of boiling water and an ice bath. Blanch vermicelli rice stick until tender (approximately two minutes), then cool rapidly in the ice bath. Using the same procedure, blanch carrots and bell peppers for approximately one minute. Use a vegetable peeler to peel the skin of the cucumber in ½ inch strips, leaving stripes of skin. Thinly slice on the bias and reserve for plating. Allow the chuck roast to come to room temperature. Season aggressively with salt and pepper. In a sauté pan over medium heat, evenly sear the chuck roast on all sides. Place the chuck roast in an insta-pot or pressure cooker. Top with aromatics and beef broth. Cook for approximately one hour or until fork-tender. Reserve for later use. Pair with a generous pour of Space Trace, our Imperial Stout aged for over a years’ time in top shelf bourbon barrels and then finished with soft, sweet coconut and Camino Verde cocoa nibs. The creamy richness of the broth's coconut milk marries beautifully with the coconut notes in the beer, while the contrasting capsaicin heat of the curry slowly builds with each sip of the spirited stout. The Public Sale for Space Trace goes live at noon on Sunday, 4/15. Check out the Eventbrite sale site here for all the details! Posted on April 14, 2018 by Patrick Whittaker. You awake to the melodic chime of the belfry ringing out through town square. The once-soft thudding rhythm of hoof to earth changes cadence to a sharp 'clip-clop-clip-clop' of cobblestone as your horse-drawn caravan enters the city gates. You pull back the canvas flap of the carriage and shield your eyes as they adjust to the resplendent light reflecting from the marble walls that tower toward the heavens. Ciceronia; the last stronghold of the known world, a shining beacon of hope for all mankind in the Kingdom of Hazemourn. As you enter the grand marketplace your caravan lurches to a shuddering halt. You leap from the carriage and make your way towards a homely looking tavern marked with a tattered grey sigil above the door. After eighteen harrowing months of questing, you've finally arrived at "The Whale's Brother." You strain to focus in the near darkness of the tavern; the humble surroundings are a stark contrast to the pristine walls of polished marble just outside. Warily, you approach the bar. Tomish the Barman, a long-bearded dwarf, grunts an introduction with a pour of grog as dark and brooding as the tavern itself. You bring the tankard to your nose and take several short sniffs, as tradition dictates in this fair land. A rush of aromatic, exotic spices whips through your nostrils. With the first sip, an intoxicating mélange of cassia bark, vanilla, and spirited bourbon dances across your palate. As The Oracle foretold; this was indeed an elixir of incomparable magnitude. With an ear-splitting crackle, a flash of white light blinds the room and a hooded figure appears in the dark tavern. Every hair on your spine stands as the ominous figure steps toward you, pulling back an emerald hood to reveal herself as Ilindsandra, Tamer of Eventbrite and infamous Troll Slayer. “It isn’t safe here,” she warns you, forebodingly. “We must make haste and leave this pla-“ Ilindsandra is cut short as the tavern door crashes inward with a deafening SLAM! A roaring mob of heavily armored orcs pile into the tavern, brandishing bludgeons and bloody keyboards. To your left, Ilindsandra begins reading from the fabled Tome of Terms and Conditions, filling the room with the violet glow of ancient Eff Five magic. Suddenly, the click of flintlock catches your ear. You whip to the right to see Tomish brandishing a heavily patinaed musket, snarling like an enraged Manbearpig -- the time has come to fight for you life: ROLL FOR INITIATIVE! We're diving deep today, folks, so take an arcane knowledge test and prepare to enter the wizarding world of baking! Or, if the thought of making your own brioche makes you fail your will check, substitute a can of Pillsbury Grand Buttermilk Biscuits to spend less time in the kitchen and more time adventuring with your party! PRO TIP: Save some time and prepare your dough a day in advance! In the bowl of your standing mixer add warm water, milk, and dry active yeast. Whisk to dissolve the yeast. Sift the flour and salt together, then add to the mixing bowl. Mix on low until the contents begin to combine. Keep the mixer on low and individually add eggs and sugar. Increase the mixing speed to medium and blend until a dough begins to form. Reduce speed slightly and begin adding butter; one tablespoon at a time until thoroughly combined. Increase speed to medium-high and mix until the dough begins to pull away from the sides of the bowl. Cover the bowl in plastic wrap and allow to sit at room temperature for an hour. After an hour of resting, your dough will have magically doubled in size! Lift the dough around the edges of the bowl, allowing it to deflate. Re-cover with plastic and allow to rise for 30 minutes. Repeat this step 3 more times. Re-cover the bowl in plastic and allow to chill, refrigerate overnight. Heat oven to 350°F and grease Bundt pan with unsalted butter. Cut brioche into 1x1 inch pillows. In a small saucepan, add unsalted butter, melt over medium heat. Once the butter has melted, add brown sugar and whisk to combine. Place granulated sugar and cinnamon into a bowl. In small batches, add the dough pieces to the bowl and coast them thoroughly with the cinnamon-sugar mixture. Arrange coated balls into the Bundt pan, evenly stacking them upon one another. Pour the melted butter and brown sugar mixture over the dough. Bake for 30 – 35 minutes. A finished brioche should be golden brown and firm with a delicate spring when pressed. Remove from the oven and invert on a cooling rack. Allow the bread to cool in the inverted pan for approximately 10 minutes. In a non-stick sauce pan over low heat, combine unsalted butter and brown sugar. Stir constantly. Once the sugar has dissolved into the melted butter, add the condensed milk. Bring the mixture to a boil. Boil the mixture for approximately one minute until it forms a thick caramel toffee. Pour the toffee sauce over your finished pull-apart bread. #LEVELUP and garnish with candied pecans or toasted chopped walnuts! My quest in creating this new food and beer pairing was to encourage group interaction -- specifically around a tabletop with my fellow Pathfinders! Cinnamon-sugar and butter create a praline-like caramel that is absolutely incredible when paired with pillowy brioche. The toffee sauce adds another layer of gooey depth, and the rich, bourbon heat of Roll for Initiative provides a pleasant contrast to temper the sweetness. Even if your party wipes at the hands (or more appropriately; eye tentacles) of a Beholder, any brave adventurer is sure to have an epic time slaying this perfectly drizzled Toffee Cinnamon Pull-Apart Bread alongside a flagon of Roll for Initiative. Don't miss the public sale this Sunday at noon! Posted on March 5, 2018 by Patrick Whittaker. Jam the Radar! It’s the BBA dessert stout you’ve been looking for! This sci-fi spoof on our World Beer Cup 2016 Silver Medal Winning Darkstar November Imperial Stout was finished with rich cacao nibs and a juicy combination of black and red raspberries. The base beer for this year's JTR release spent 14 months in top-shelf bourbon barrels -- that's longer than Han Solo spent frozen in carbonite, folks, and a beer this rich and complex can only be paired with perfection! We’ve combed the desert for a dessert of unparalleled deliciousness. Your father’s-brother’s-nephew’s-cousin’s-former-roommate will know you’re a master of the Schwartz when you pair a slice of this Chocolate Marquise with a generous pour of February's Stasis Project release. Lightly grease a standard size [8 ½ x 4 ½ inch] loaf pan. Line with plastic wrap, and leave about 2 inches extra to hang out and over each side. Use an electric mixer to beat the yolks and sugar in a heat proof-bowl until light and pale, approximately one minute. Place your heat-proof bowl over a pot of boiling water (commonly referred to as a double-boiler set up, or “bain marie” if you fancy). Add chocolate pieces and whisk until melted. Add butter, one piece at a time, whisking until thoroughly melted. Remove from heat and fold in cocoa powder. Allow to cool for five minutes. Put the vanilla bean on a cutting surface. Using the tip of a paring knife cut the bean lengthwise. Use the point or edge of the knife to scrape the seeds loose from the pod. In a separate mixing bowl, beat cream and vanilla bean seeds until soft peaks form. Add a small amount of the vanilla cream mixture into the chocolate mixture and mix to combine. Slowly add the remaining cream and gently fold until thoroughly combined. Pour into your greased loaf pan and cover with plastic. Place in a refrigerator overnight to set. In the photos here, you'll see I’ve opted to use silicone molds for individual-size servings of Marquise! Once the Marquise has set overnight and feels firm to the touch, it’s ready to serve! Place your preferred serving platter upside down on top of the Marquise, in the pan. In a quick fluid motion, flip the platter over while bracing the loaf pan so the pan is inverted on top of your serving plate -- gravity will do the rest! Remove the plastic wrap. To cut the Marquise, prepare a pot of warm water suitable for dipping an entire knife. Temper your knife in the warm water and wipe dry with a towel. Working quickly, cut a slice from your Marquise. Temper your knife and wipe clean after each slice. Serve with macerated raspberries or raspberry coulis (or both! ), and a generous amount of Chantilly cream! In Jam the Radar 2018, the tangy sweetness of black and red raspberries oozes into complex layers of rich, roasty cocoa nibs. Chocolate malts and a spirited bourbon bite enhance the depth and overall character of the brew, and an unmistakably jammy finish leaves the palate craving more. This pairing is all about the beer: the rich, earthy bitterness of cacao nibs played against the dark chocolate in the mousse allows berry sweetness of the beer to perfectly harmonize with the fruity, dark chocolate character of the dessert. 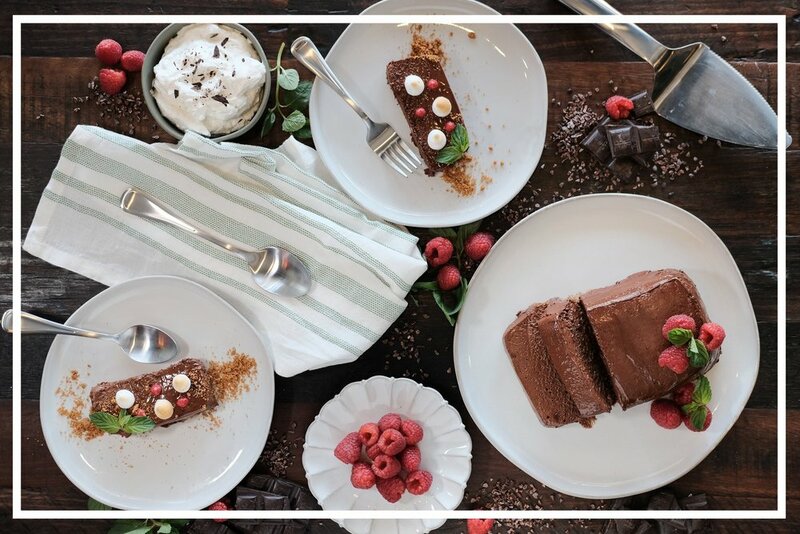 The chocolate marquise is incredibly easy to make and can be dressed up for entertaining at a dinner party or served as a no-frills mid-week turn-up in your desert routine. Ditch that pint of 7-11 ice cream and treat yo' self! Posted on February 15, 2018 by Patrick Whittaker. Sharing sentiments at Karl Strauss Anaheim. We are all nerds in some respect, right? Comic-Con cosplayers, Tri-Wizard Champions, automatic door Jedis, Azerothians, you name it. Today we're diving deep with Tommy, one of our Tasting Room Leads (and BLB Fantasy Football League Commissioner) who's always all-in when geeking out. What videogame have you spent the most time playing? In my entire life, Final Fantasy 7. It came out when I was in the fifth grade and that was my game. Right now I'm playing a lot of Blizzard's Heroes of the Storm. It's really competitive and it's only 20 minute rounds (I'm old and don't have an hour-long attention span anymore). You’ve been at Bottle Logic for Three Years now, what are your favorite BLB beers? Red Eye November or Fundamental Summation. Really, whatever Stasis Project beer has coffee in it. And Double Actuator. And Greyhound. What would surprise us about you? I don’t tie my shoes. I only tie them once and then I use a shoehorn to put them on every day. I have one in my car, and one in my backpack, and a ton at home. I think I’m the only person I know who uses a shoe horn. What are you most proud of in your bottle logic tenure so far? 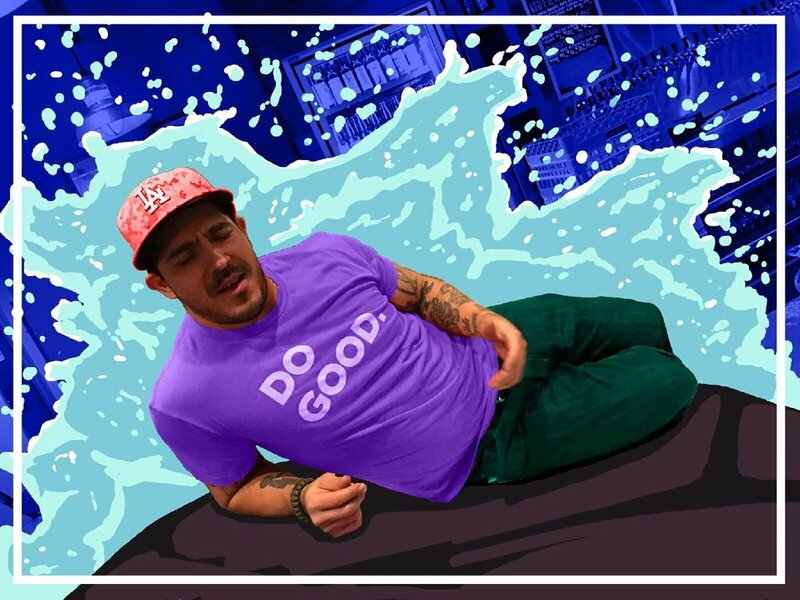 Helping develop some of the merchandise and branding elements has been cool. Dad Caps were the first merch item that I saw through from start to finish. When I said we needed them, we tested them and they sold like crazy in just a couple of days. And that Stasis Project print Teku glass with its 24 hour sell-out!? These things please me greatly. Also, anytime I can really connect with someone across the bar, and then see them come back to the Tasting Room is a personal accomplishment for me. Getting them to come visit again, and getting to really dig into our beer with them. I love that. What's the most memorable brewery trip you’ve ever had? Pizza Port in Bressi Ranch. We did that as a team building event with all of the staff. Pizza Port was our second stop of the day and I had promised myself that I would have only one beer so I could stay in the game. We had one beer at lunch and then did a tour of their insane facility -- including the packaging lines where fresh Swamis cans were distributed and immediately shot-gunned. My day spiraled out of control from there. We were in the bus back playing Mario SuperKart on our Nintendo Switches (flats of Swamis 4-packs in tow). I picked the Rainbow Road track like 8 times in a row and everybody hated me for it. It's still a thing. Terminator 2 is the best action movie of all time, but Terminator 1 is the best romance film ever. Believe me. It makes the movie so much better if you watch it as if it were a love story between Kyle Reese and Sarah Conner. 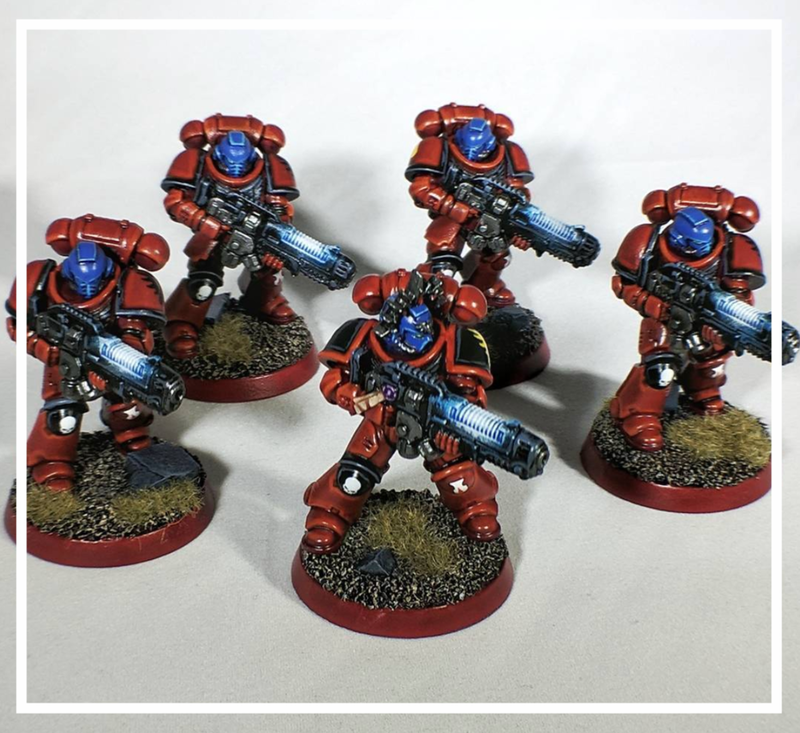 Tommy's hand-painted Blood Angels 2nd Company Hellblasters for Warhammer 40k! If the Many Fruited God endowed you with a superpower, what would it be? Superpower or superhero? Well either way it's the same. Wolverine. So my body would be invincible and I could f*** s*** up. Claws and regeneration, what else do you need? Adamantium bones, sign me up! Posted on January 17, 2018 by Marissa Maynor and filed under Team Logic and tagged teamlogic supnerds warhammer40k dadcaps. If you’re like me, your October has been spent re-watching the first season of Netflix's Stranger Things. On my second spin through the series, I’ve found myself with a long list of unanswered questions -- at the top of the list: What's going on with Barb?! Aside from the untimely demise of Harambe, few events in 2016 shook the internet more deeply than the loss of everyone’s favorite mom-jean-wearing, socially awkward teen. We're all for fan-theories here, so we're clinging to the glimmer of hope that she's alive somewhere in the eerie nether world of the “Upside Down”. This brunch recipe is sure to comfort you after a long night of binge watching season two, regardless of the fate of Nancy's beloved BFF. My rendition of the Dutch baby is comparable to a deep-dish crepe. The richness of ricotta adds a decadent creamy texture contrasted by the tart sweetness of macerated blackberries. Raise a glass, and spit out a black slug for the Patron Saint of Hawkins and dive into another dimension of flavor with this deceptively simple recipe for my blackberry and ricotta Dutch Baby. Don’t forget to wait an hour before swimming after you eat your Dutch baby…or you might go missing. Photos by @kevinwtackett. Preheat your oven to 350°. Place a cast iron Dutch Oven into your oven. Allow the cast iron to preheat for approximately 30 minutes. In a blender combine eggs, Ricotta, salt, and milk. Blend on medium high for approximately 30 seconds. Add flour and lemon zest to the blender. Blend thoroughly for approximately 30 seconds. Use a rubber spatula to scrape the sides of the blender. Blend for an additional 30 seconds. Carefully remove preheated cast iron skillet from the oven and place on your stove. Add 2 tablespoons of unsalted butter. Use a wooden spoon to spread the butter across the base of the hot skillet until melted. Pour batter into the base of your pan. Place the pan into your oven and bake for approximately 40 minutes -- until golden brown and crisp. PRO TIP: At this stage I like to turn the broiler on and crisp up the top just before serving! In a mixing bowl, add blackberries, sugar, lemon zest, and 3 oz of Upside Down or a comparable tart/effervescent fruited ale if you missed the online can sale. (Samuel Smith Raspberry or Lindeman’s Framboise are excellent substitutes -- or even Champagne if you’re extra AF.) Allow the flavors to marry for approximately 30 minutes in the fridge prior to garnishing. Cut your Dutch baby into quarters and finish with a squeeze of lemon, a spoonful of macerated blackberries, and a generous dusting of powdered sugar. Turn up your brunch to eleven and pair this recipe with a pour of The Upside Down, our Tart Wheat Ale brewed with blackberries and vanilla and enjoy the subsequent psychokinetic nose bleed! Posted on October 17, 2017 by Patrick Whittaker and filed under Food Bloggin' and tagged FoodBloggin' TheUpsideDown BrunchWithBarb. We sat down with the ever hilarious beer-tender, Gilbert Camacho, to get to know the man who calls himself “The Champ”. You can always count on him for good conversation at the bar, especially when a game is on, but what else lies beneath those flat-billed hats? "I think I would want to be able to move cars with my mind so I could always have a parking spot. Oh wait! Maybe just teleport. So then I'd never have to worry about parking at all." WHAT IS YOUR BIGGEST ACHIEVEMENT AT BOTTLE LOGIC? "Do you remember the rise of the basilisk last year? I wanted to fill the board with basilisk characters of all kinds- my favorite was the baSUHlisk that we did for our Hoperating System IPA. The whole staff developed this whole set of ridiculous rules to properly draw a basilisk - we couldn't erase or redo if we made a mistake and no matter how well you drew them the first time, we made everyone redraw the eyes at least once. It had to stop when we brought shame to the basilisk family because they started looking so bizarre." SPEAKING OF THAT CHALKBOARD, WHAT ARE YOUR FAVORITE BEERS? "From Bottle Logic, last year’s Berlinear Equation with Blueberries and Ground State Imperial Stout -- Ground State was the first barrel-aged beer that I ever got into. Otherwise, I really like Russian River’s Blind Pig IPA. If I were stranded on a desert island, I wouldn't have much to do so I'd want something light and sessionable so I could just keep drinking it all day." WHEN YOU’RE NOT WORKING OR VISITING TASTING ROOMS, WHAT YOUR HOBBIES? 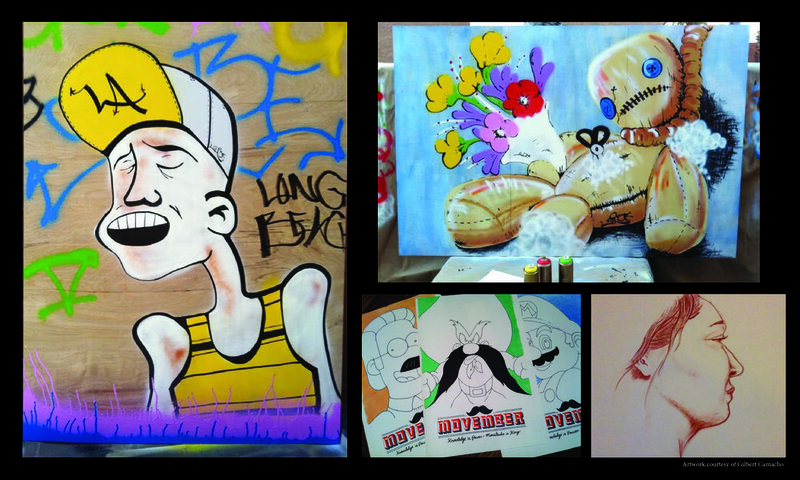 "I like to paint, especially on wood panels. I really like Yoshitomo Nara’s work so I tend to paint cartoony, over exaggerated characters. Even some of my tattoos are from Nara’s work." Come by and throw a “Suhh” to Gil in our tasting room anytime! With Harry Potter season around the corner, don’t be surprised if a basilisk makes a reappearance on the tasting room chalkboard! Posted on October 11, 2017 by Marissa Maynor and filed under Team Logic and tagged teamlogic gilby. I’m currently in my kitchen twerking and singing “Get your braise on, get your braise on” in the style of the incomparable Missy Elliot. Why, you ask? One, I’m a dork. Two, this recipe for Caramel chicken wings is lit, fam! Pressure cooking the chicken wings prior to frying couples a fall-of-the-bone tenderness with a crisp exterior that's sure to Level Up your wing game. This recipe will easily steal the show at your next bottle share or game day feast, and with a little prep a head of time, you can fry these up with time to spare on the day of your event. On a recent trip to Portland I encountered the iconic north-western fusion of Thai-style Ga Kho chicken and pub-staple chicken wing. Deceptively simple, these wings are a total flavor bomb that hit every corner of sweet, salty, spicy, and savory. Trust me when I tell you they are as good [and insanely addictive] as they sound. It’s a no brainer why these are an institution in a city with one of the most vibrant dining scenes in the country. Bring a pot of water to a boil - a kettle works best. Reserve for a later step. In a medium sauce pan, add sugar. Heat the sugar over medium-high heat until it begins to melt and caramelize. Do not walk away from your pan at this step, sugar has a tendency to burn! PRO TIP: Use caution at the next step -- the sugar will be very hot! Use a long handled spoon to stir at the next step! Once the sugar has caramelized and has become a lump free liquid, begin adding the water in small amounts, mixing with a long handled spoon or whisk until the sugar has dissolved. PRO TIP: Time for real talk, ya’ll. Fish sauce has a rather distinct aroma, and at this stage of the recipe things are going to get…pungent. It’s unavoidable, but damn, I guarantee you it’s worth the trouble. Just do yourself and your friends a solid and prep this ahead of time, and open a window! The sauce will hold for up to two weeks and can be reheated when you're ready to enjoy. Add your fish sauce to the pan and simmer on high for two minutes. At this stage the caramel should coat the back of a spoon. Reserve half of your sauce to toss your finished wings. Put half of the wing sauce in a medium sized mixing bowl. Add the rice wine vinegar and sambal and whisk to combine. Add the mixture to your pressure cooker. At this stage add the aromatics; lemongrass, ginger, garlic, kafir lime leaves, and the stems of one bunch of cilantro, reserving the leaves as garnish. Add 1 quart of chicken stock. Using a wooden spoon mix to combine. Add the chicken wings and cook for 40 minutes or until tender. Alternatively, if you do not own a pressure cooker you can braise wings in a 350˚ oven for approximately 2 hours, or until tender. Once the wings have finished cooking, remove from the braising liquid and place on a sheet tray to cool. Once the wings have cooled, refrigerate for a minimum of 4 hours -- overnight is best. In a large pot, heat two inches of oil to 400˚ degrees. Add corn starch to a large mixing bowl. Gently coat your wings in a thin, even layer of corn starch, shaking off the excess, and place on a clean sheet tray. Fry the wings in small batches until golden brown and crispy, approximately 1-2 minutes per wing. In a large mixing bowl, combine your reserved wing sauce with the juice and zest of one lime. Add your fried chicken wings to the mixing bowl. Gently toss the wings to coat evenly. Plate your chicken wings in a bowl and garnish with hand torn mint and cilantro leaves. 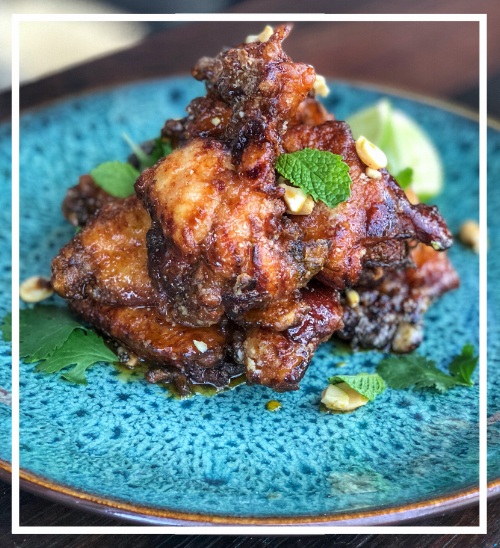 Enjoy these caramel chicken wings with a pour of Mxyzptlk! Layers of rich, caramel-y sweet dulce de leche coupled with the roasted earthiness of Cuban espresso beans, spicy cassia bark, and robust rum barrel character create a nuanced and complex flavor profile that is complimented by the sweet and savory nature of this dish. Enjoying these two tasty treats together just might cause a ripple effect across all dimensions -- enjoy responsibly! Posted on October 11, 2017 by Patrick Whittaker. "I'm going for Bon Appétit meets Game Informer, is society ready for it?" The season of basic is upon us! It’s time to dig out your Ugg Boots, order that ex-hot, no-whip soy PSL, and pretend that you haven’t been working on your winter bod since mid-July. I literally can’t even! But just because your taste in footwear is basic doesn’t mean your grub needs to be. While the sweltering heat of this long-winded California Summer lingers on, I find myself craving the creature comforts of Autumn, a season not truly understood by the sweet Summer children of Orange County. This recipe for roasted leg of lamb, green harissa, and a parsley + hazelnut salad is the perfect balance of light Summer vibrancy and indulgent Autumn comfort food as we head into the season of Pumpkin Beer! Want to take your meat feast to the next level? Pair your creation with a pour of “Picture If You Will” for a pinky-out flavor experience sure to impress the whole table at your weekly Pathfinder game! Photo by @kevinwtackett. The richness of lamb coupled with the warm, seasonal flavors of the north African spice blend 'Ras El Hanout' creates a symphony of synergy when paired with the festive seasonal spice inherent in our Bourbon Barrel Aged, "Picture If You Will." The crisp edges of the roast echo the soft caramel and vanilla flavors imparted throughout this Pumpkin Ale's seven-month snooze in top shelf bourbon barrels. Vibrant green harissa provides a contrasting herbaceous note for a bit of intrigue when paired with each silky sip. Check out the recipe below and tell us about your ideal dessert pairing for "The Spice Must Flow," our true PSL-inspired rum and bourbon barrel aged riff on PIYW, in the comments! Temper the harissa heat with a splash of cool lemon herb yogurt and herbaceous parsley and hazelnut salad. Photo by @kevinwtackett. Season your leg of lamb aggressively with salt and pepper. Optional step: to step up your flavor game, season your lamb with Ras el Hanout, a North African spice blend available at most specialty spice stores. Place your leg of lamb on a sheet tray lined with parchment. Cut the top off of a whole head of garlic. Drizzle with olive oil and season with kosher salt. Cut a lemon in half. Place prepared garlic and lemon on the sheet tray with the lamb. Cover the entire tray with foil and cook for approximately 1.5 hours. After the lamb has been roasted, remove the foil and cook for an additional 15 minutes to crisp up the exterior. Once removed from the oven, allow lamb to rest - covered - for at least 20 minutes before slicing. Plate the roasted garlic and lemon garnishes with your lamb. In a small sauté pan over medium-high heat, toast the cumin and coriander seeds until they’re light golden and fragrant. Remove from the pan and place on a plate to cool. Add all ingredients into a blender. Blend on a medium-high setting for approximately 30-60 seconds to create a smooth, homogenized sauce. Season the sauce with salt [to taste] and transfer to a small bowl. This portion of the recipe can be prepared up to two days in advance! In a medium sauté pan over medium-high heat, gently toast hazelnuts until golden and fragrant. Transfer them to a sheet tray lined with parchment paper and allow to cool. Once cooled, coarsely chop and add to a mixing bowl. Using a micro plane, zest 2 medium size lemons and add to a mixing bowl. Remove parsley from the stems and roughly chop. Add to a mixing bowl. Dress your salad with a splash of olive oil and lemon juice, then use as a garnish for your roasted leg of lamb! Achievement unlocked; you totally nailed dinner! Everyone at the table is slipping into a meat and beer-induced coma. The Ubers are in route, and the only thing standing between you and the new Leviathan Raid in Destiny 2 is that towering pile of dishes. They’ll be there in the morning though -- you've gained some serious culinary XP tonight, Fellow Gamer. Time to pour a nightcap and bask in the glory. Posted on September 13, 2017 by Patrick Whittaker and filed under Food Bloggin' and tagged PictureIfYouWill PIYW TheSpiceMustFlow TSMF PictureIfYaBasic brewenplace.